In the final event of the 2018 Russian National Figure Skating Championships, Alina Zagitova won her fifth gold medal this season and her first senior nationals title with 233.59 points. Maria Sotskova finished second with 221.76 points, while 14-year-old Alena Kostornaia won the bronze (216.57). Zagitova, who performs all her jumping passes in the second half of both program, was not flawless, but increased base value and high grades of execution on the clean jumps were enough to give her more than 10-point advantage over the nearest competitor. The skater said that winning the national title was very important for her. 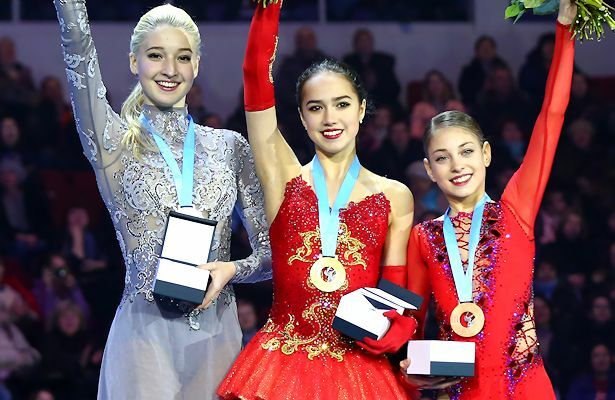 The student of Eteri Tutberidze won every competition she entered in her first senior season, but admitted that she had doubts about her ability to succeed. The skater, who was 11 at the time of the Sochi Winter Olympics, is upset, but not worried about the perspective of competing as a neutral athlete at the 2018 Winter Olympic Games. Maria Sotskova delivered a clean short program, but made mistakes on the landings of a triple loop and triple flip in her free skating. The 2016 World Junior silver medalist said that recently the Russian Nationals have become the hardest competition for her. When asked why ladies deliver better performances than men she attributed it to the lack of quad jumps. Kostornaia finished fourth in both programs, but won bronze medal overall. Like her training mate Zagitova, she also performed all her jumps in the second half of the program. The fourth place went to Stanislava Konstantinova (211.28), who was only 10th after the short program after she doubled a planned triple flip. The student of Valentina Tchebotareva delivered an expressive routine to the Anna Karenina soundtrack which featured seven clean triple jumps and finished third in the long. Polina Tsurskaya, who was third after the short program, slipped to fifth place in the overall standings (207.61) after she singled a triple Lutz in the second half of her long program. The student of Eteri Tutberidze, who was previously sidelined with an injury, said she had completely recovered now. Still, she has not regained full confidence yet. The 15-year-old Anastasia Gubanova rounded up the top six (206.60). Elizaveta Tuktamysheva finished seventh (202.06), Serafima Sakhanovich, who trains in Evgeniy Plushenko’s school, was ninth (197.44) behind the 2018 ISU Junior Grand Prix finalist Daria Panenkova (201.97). Elena Radionova finished 10th (196.78). The top three ladies were named to the upcoming European Championships next month. The two ladies that place the highest at Europeans will be named to the Olympic team based on the discretion of the coaching council. Marina Cherkasova and Sergei Shakrai (RUS) performed the first ever quadruple twist at the 1978 European Championships. Which pairs have done the move successfully and/or do you think will be the next to land it?